Video is now available of the STSA 2014 expert panel discussion on the use of ECMO in the treatment of adult pulmonary failure. 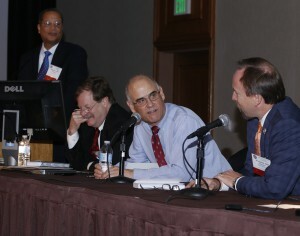 Participants included (from left), Marcus Williams, MD; Robert Lee, MD; Joseph Zwischenberger, MD; and Thomas Wozniak, MD. STSA partnered with CTSNet this year to create and share select video presentations from the 61st Annual Meeting with the CT surgery community online. The STSA 61st Annual Meeting took place November 5-8, 2014 in Tucson, AZ. Video of the November 6, 2014 Postgraduate Program Clinical Care Case Presentation & Expert Panel Discussion, titled ECMO & Your Hospital, is now available. Marcus G. Williams, MD begins the discussion by presenting the case history of a 42-year-old patient who was placed on ECMO after an acute lung injury that resulted in increasingly difficult oxygenation and worsening hypertension. Panelists Thomas C. Wozniak, MD and Joseph B. Zwischenberger, MD discuss the case and share their own ECMO tips and techniques. Assess the need for Veno-Venous vs. Veno-Arterial ECMO. Discuss preferred and alternative cannulation sites and techniques. Discuss the components of an ECMO circuit. Discuss anticoagulant management of an ECMO patient. Discuss weaning techniques and criteria for separation from ECMO. Read about the development of the 2015 STSA Postgraduate Program, which will take place in conjunction with the 62nd Annual Meeting on November 5 at Disney’s Yacht & Beach Club Resorts in Lake Buena Vista, FL. Learn more about the STSA Annual Meeting at www.stsa.org/annualmeeting. View all STSA 61st Annual Meeting video presentations on CTSNet.